In this tutorial, you will learn how to register a thing to IoT-Ignite. Thing objects are the endpoints of IoT-Ignite. In IoT-Ignite, every sensor and actuator is presented as a thing. You have to connect a thing to IoT-Ignite and register it to one node . Every “thing” object can receive configuration and action messages. It can send several types of data to IoT-Ignite. 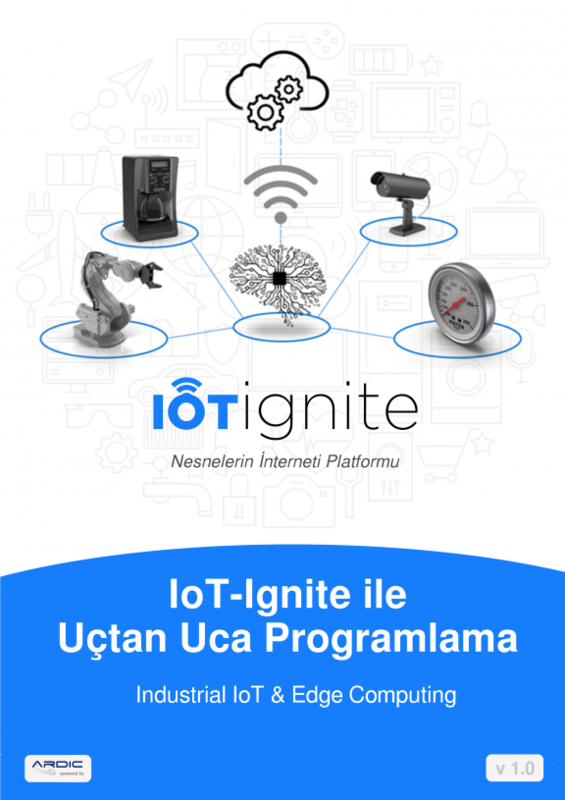 You can find detailed information about connecting your application to IoT-Ignite in Connecting Android Application to IoT-Ignite document. You can also find detailed information about how to register a node in Registering Node to IoT-Ignite document. Create the thing instance using previously created node. /**Define your thing type here. Use ThingType object. /**This boolean flag states if your thing can act as an actuator or not. *   This thing can receive action messages over listener callback besides snding data. * - onConfigurationReceived(): Occurs when configuration setted by IoT-Ignite. * - onActionReceived(): If your thing is set as an actuator, action messages sent will be handled here. You have successfully registered your thing. Now let’s set this thing as online. * This is important for separating identical sensors manufactured by different vendors. /** Set thing data type. /*Node Type is definition for node. If your node is a physical device, you can state it here. * GENERIC : Default node type. If you do not want to do type based things, this will work for you. * If your node is Raspberry Pi and you are going to deal with "RasPi" specific things like RaspiCam, choose this one. /*Node Listener : Callback for node unregistration. Nodes can be unregistered from enterprise.iot-ignite.com remotely. * Node is not null and not registered. Register first and set connection online. * Register node here. If registration is successful, make it online. * Node is already registered. Set connection to true. * As node is registered, it is time to bound a thing to our node. /*Define your thing type here. Use ThingType object. * Set this true. When set it true your things can receive action messages over listener callback. * - onConfigurationReceived() : Occurs when configuration setted by IoT-Ignite. * - onActionReceived(): If your thing set as actuator action message will handle here. * Check thing object. If registered make it online. * then make it online. * Thing is registered. Set connection to true. * Set all things and nodes connection to offline. * When the application close or destroyed. * Thing configuration messages will be handled here. * For example data sending frequency or custom configuration may be in the incoming thing object. Build and run your application. Your device inventory will be sent to the IoT-Ignite Cloud and you will be able to see it.